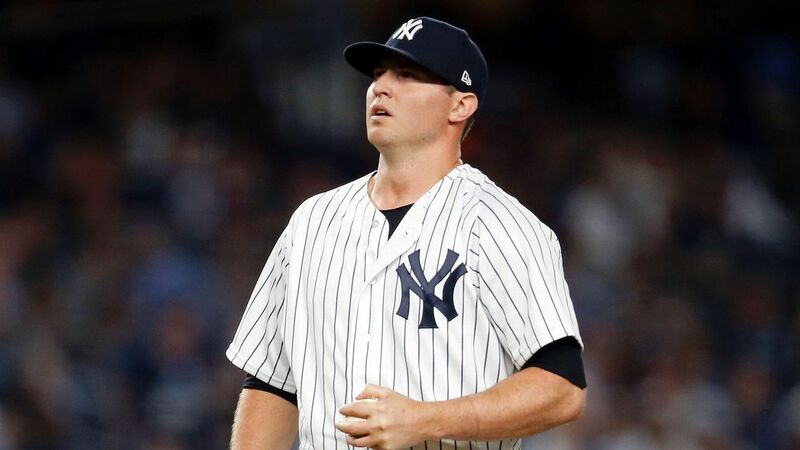 The New York Yankees have built one of baseball’s most formidable bullpens, and on Thursday they added one more K.
The left-hander reached agreement on a three-year, $39 million deal to stay with the Yankees, sources told ESPN’s Jeff Passan last month. Britton, 31, landed in New York last season via a trade with the Baltimore Orioles. He went 1-0 with a 2.88 ERA in 25 innings for the Yankees and finished the season with seven saves and 34 strikeouts over 40⅔ innings in 41 appearances. Britton began the 2018 season on the disabled list after tearing his right Achilles tendon the previous December. He made his debut on June 12 and appeared in 16 games, going 1-0 with a 3.45 ERA and four saves before being traded by the rebuilding Orioles. He did not allow a run in his last eight Baltimore appearances, surrendering just three hits over eight innings. In 2016, Britton was exceptional. He was 2-1 with a 0.54 ERA and 47 saves in as many chances. He converted an American League-record 60 consecutive save opportunities from Oct. 1, 2015, to Aug. 21, 2017. Over his eight-year career, all but two months with the Orioles, Britton is 31-22 with a 3.21 ERA and 142 saves.